~ Lock your vehicle and close your windows. Even if you’re just popping out of your car for a quick second. Thieves don’t need a lot of time to take advantage of your laxity. ~ Choose your parking spots wisely. Dark, secluded areas make it easy for a break-in to happen without anyone noticing. Favour well-lit, busy areas for parking. Try to park near or under a streetlight if you can. Or use a parking garage that is attended. ~ Keep everything hidden away. Even if you know it’s not valuable, a potential thief has no idea that there’s nothing of value in the bag. The potential is enough of a motivator. Of course you should never leave out money, wallets, purses, phones or electronics but also avoid leaving out other less obvious items such as a briefcase, backpack or other type of bag, a laptop bag (yes, even if you don’t have your computer in there), shopping bags or loose change. Even a few dollars can be motivator for someone who is desperate. ~ If you must have valuables in the car, put them in the trunk or otherwise ensure that they are not visible. It’s also recommended to move items into the trunk before arriving at your destination. Thieves can be on the look out for drivers who are moving things into their trunks before walking away from their cars. ~ Alarms can be a very valuable tool against break-ins. If you don’t want to invest in an alarm, this article suggests purchasing a blinking light that looks like an alarm. 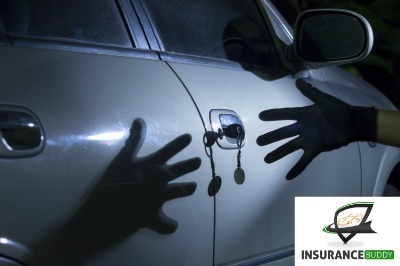 Be sure to ask your insurance provider about any possible discounts for using vehicle protection or anti-theft devices. Dealing with a break-in is never pleasant. In short, preventing a vehicle break-in is all about making things as hard as possible for would-be thieves. Have any questions about vehicle break-ins and your car insurance? Someone from our team would be happy to discuss with you. Click here to connect with us. Or click here if you’re looking for a car insurance quote.